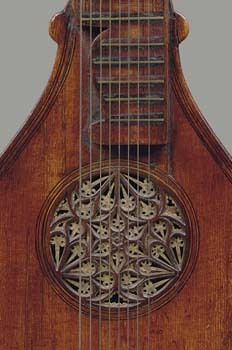 The cittern was described by Christie's as being sold "from the collection of the Barons Nathaniel and Albert von Rothschild."3. 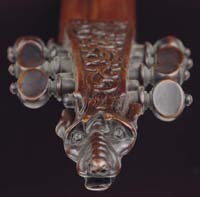 Nothing of the instrument's provenance prior to this is currently known by this author. While a maker's label is present, the only thing that can be said for certain is that the first letter is a stamped letter 'P',4 the rest of the label being too obscure to read, at present. 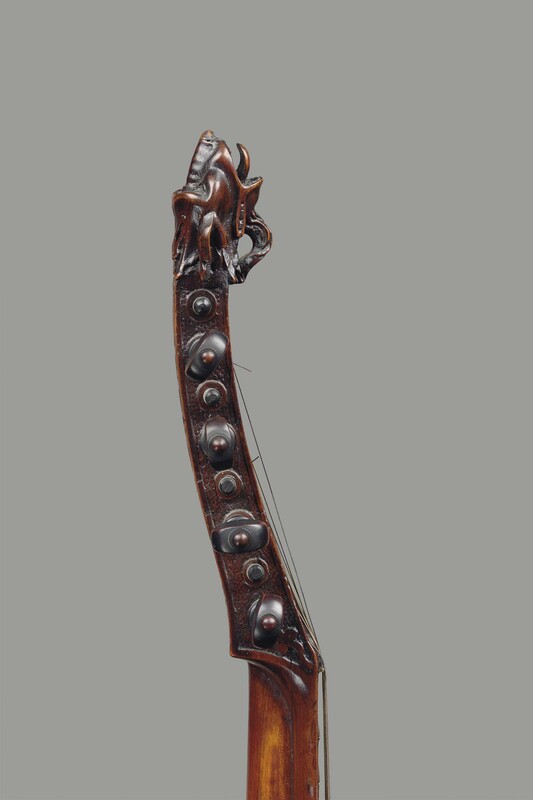 Christie's attribution of this instrument as being "probably English" can be seen by some of the information below. 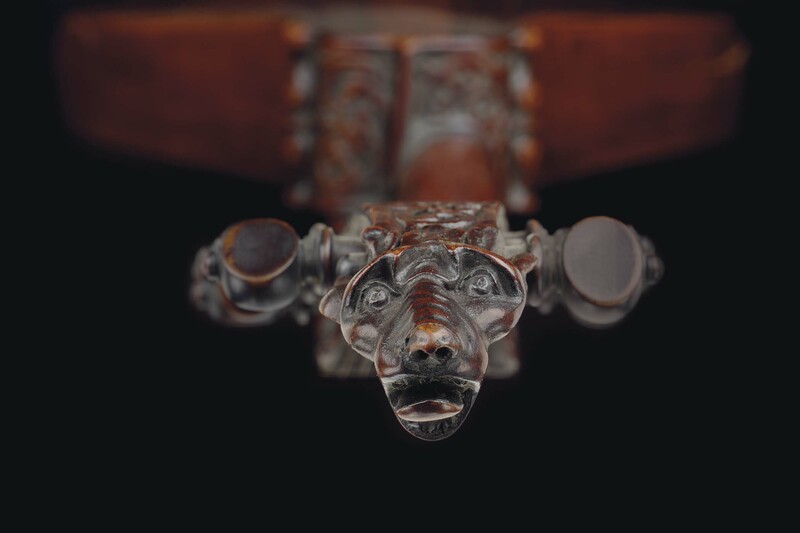 The end of the pegbox terminates in a dog's head. It may be worth noting that the head does not point back toward the instrument as is common on other extant instruments and most (or all?) iconographic sources. The neck is "cut away" at the bass side of the fingerboard after the usual manner. 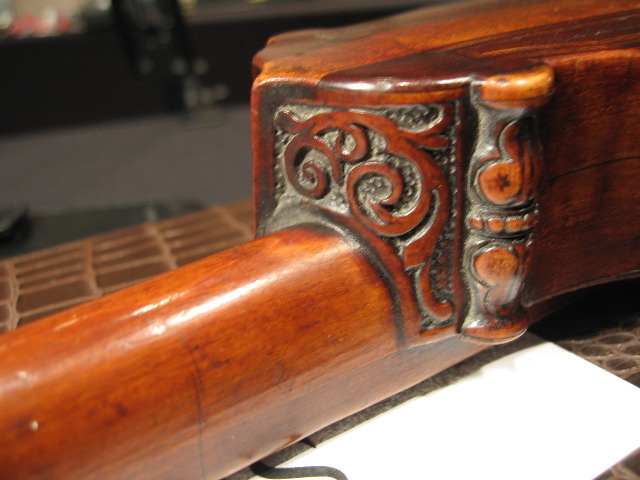 The fingerboard extends into the pegbox and is incorporated into the decorative carving at the sides.19 The end of the fingerboard is attached to the soundboard rather than cantilevered over it. 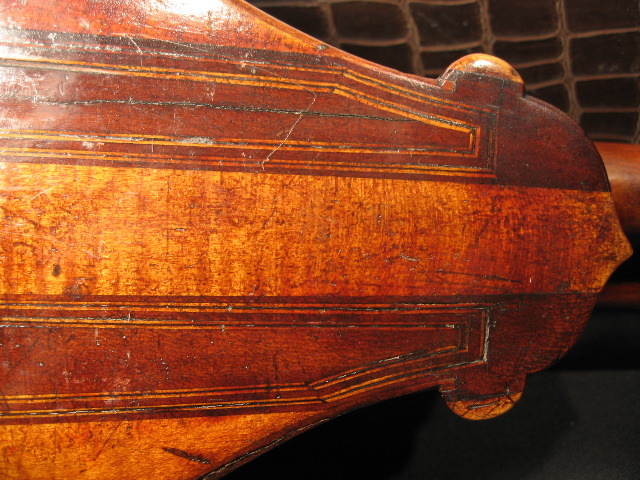 On the face of the fingerboard there is "triple" purfling on both the bass and treble sides (see close-up photo under Images, above), though oddly reversed in color-pattern (white/black/white).20 Purfling on the treble side ends at the 17th fret; that on the bass side ends at the 12th. 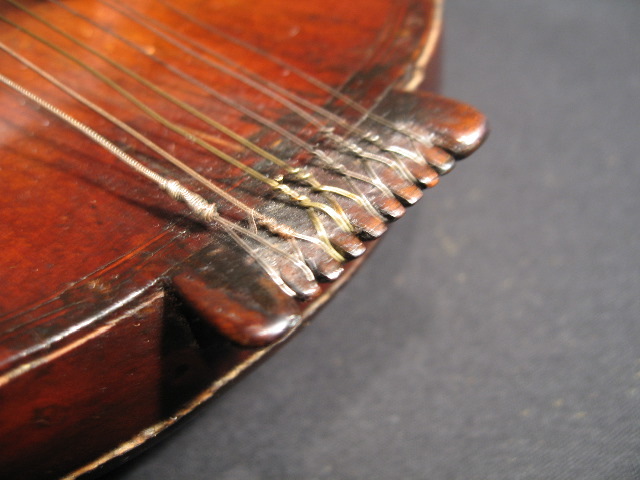 Fretting is chromatic and appears to employ only 17 frets (the 18th usually being absent on chromatic instruments; the 19th left off deliberately because of the small scale length?). 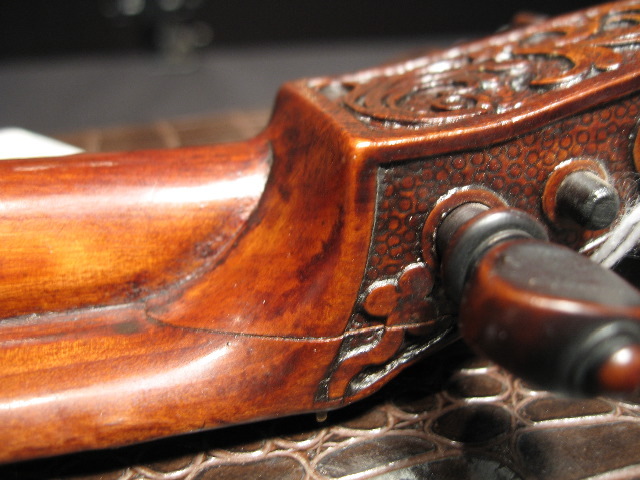 The brass frets are held in by wooden "wedges" which employ the alternating color-coding usually seen on chromatic instruments, with lighter colored wedges at frets 1, 4, 6, 8, 11, 13, and 15. According to the description by Christie's, the pegbox can accomodate "nine strings in five courses"; however a quick count of the pegs shows there only to be eight pegs in the pegbox with no apparent room for another. 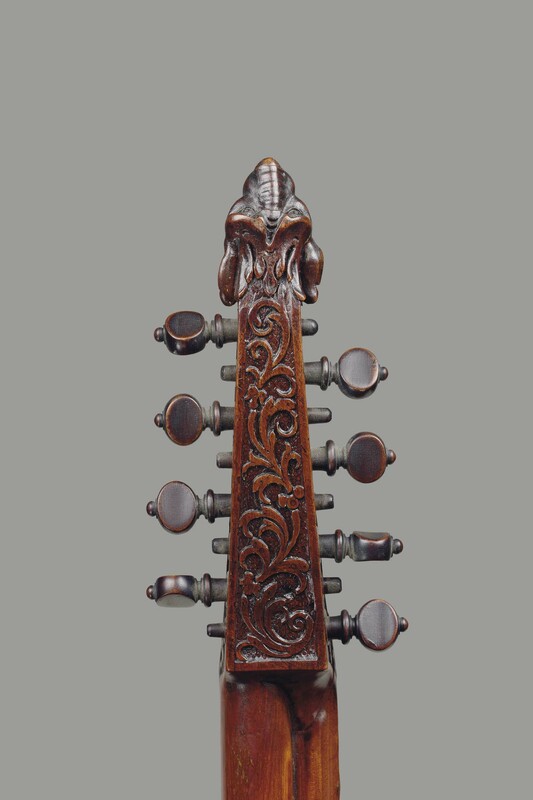 The current 8 strings have been respaced to create eight single strings in eight course rather than eight strings in four courses, requiring alteration to both nut and bridge. 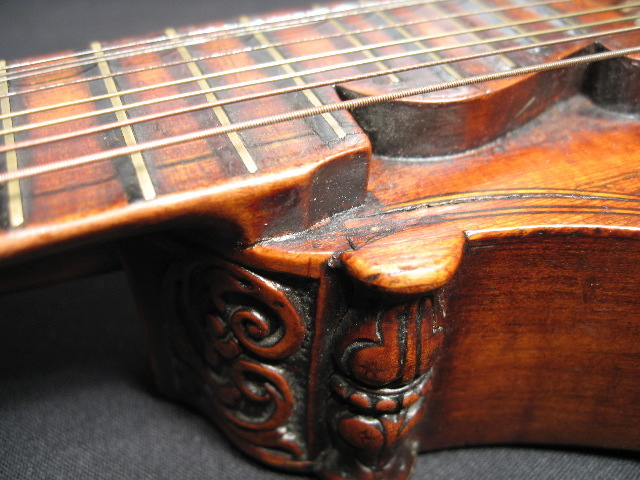 The nut and bridge are not believed to be original.25 The reason for the change in string setup is unknown and would certainly make any attempt to play the instrument as it is now next to impossible. 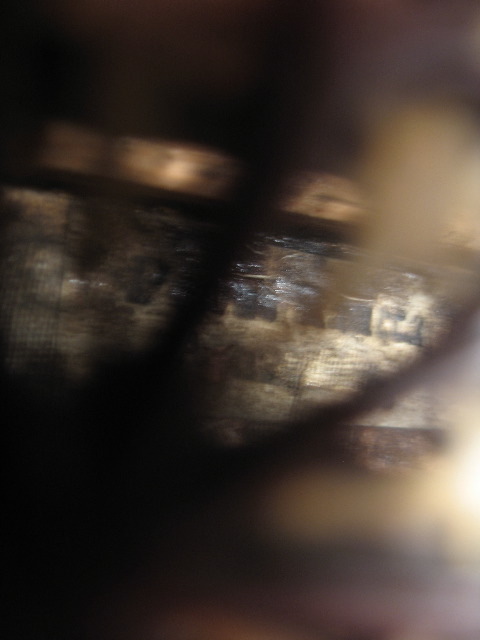 The strings are anchored at the bottom of the instrument via a wooden "comb". 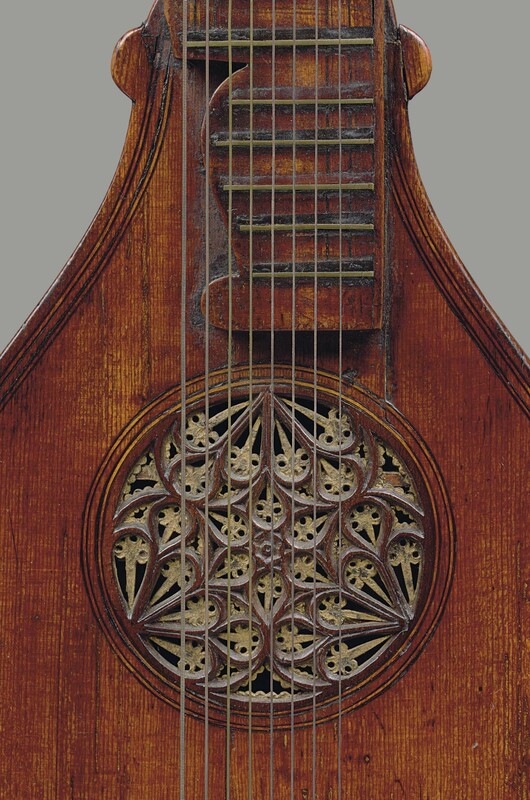 While this feature is somewhat older in style and commonly found on carved citterns, it is not entirely unknown in constructed ones (see, for example, the large possibly-late 17th century cittern D.32026 in the Musée des Arts Décoratifs, France). 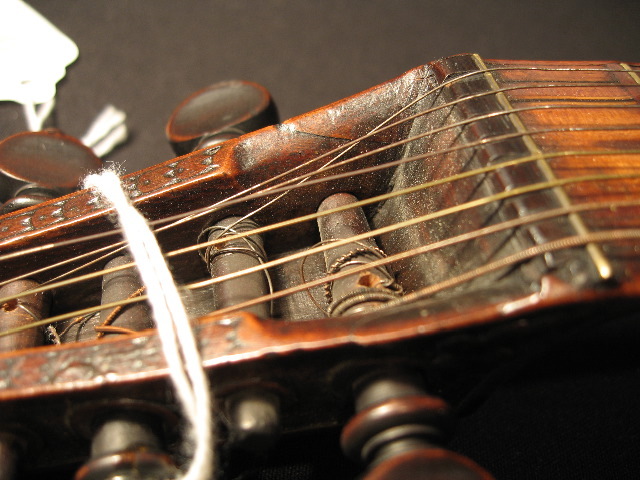 According to Peter Forrester, one probable method of fastening strings to a comb (suggested by the lack of wear under the combs and at the teeth ends) involves using a single length of wire for both strings of a course and a rod under the comb: One string end is threaded from a tuning peg, down through one of the slots in the comb, around a metal rod held in place by the tension of the strings, then fed back through the next slot in the comb and back to the next tuning peg (see Illustration 1 in the article "Wood and Wire"). 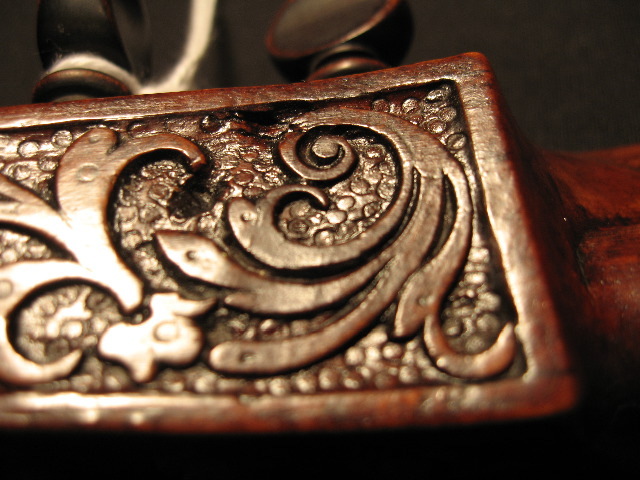 The other method of hooking the loops of individual strings around the teeth of the comb could result in the wood of the teeth breaking, which can be seen on many surviving instruments. 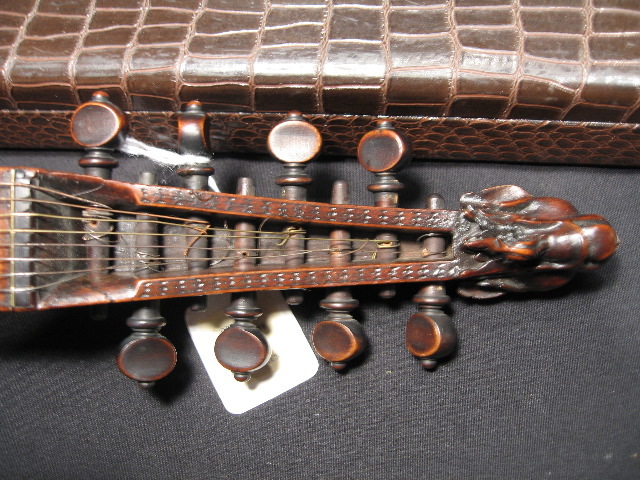 This instrument appears to use this latter method of anchoring the strings and has the same number of teeth as strings. 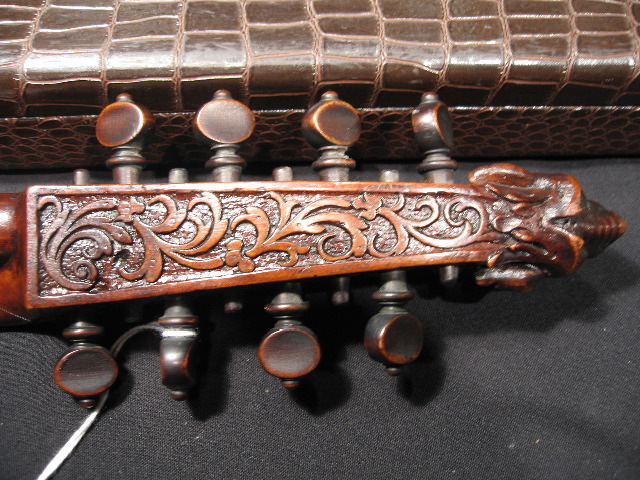 While a comb on an otherwise constructed instrument is not unusual,26 and it is not entirely uncommon to have the string loops attached to the teeth of the comb,27 it should be noted that this comb is slightly unusual in a number of other respects, suggesting that it may not be original or may have been altered. For one, the comb shows an unusual lack of wear at the teeth and under the comb, but there are too few slots in the comb for the "rod under comb" method to be used.28 Also, according to Peter Forrester, under the comb there is not usually such a sharp corner with the body.29 A final determination of the autheniticity of the comb will need to await a full examination from the National Music Museum. A drawing of the instrument may be available from Andrew Rutherford. 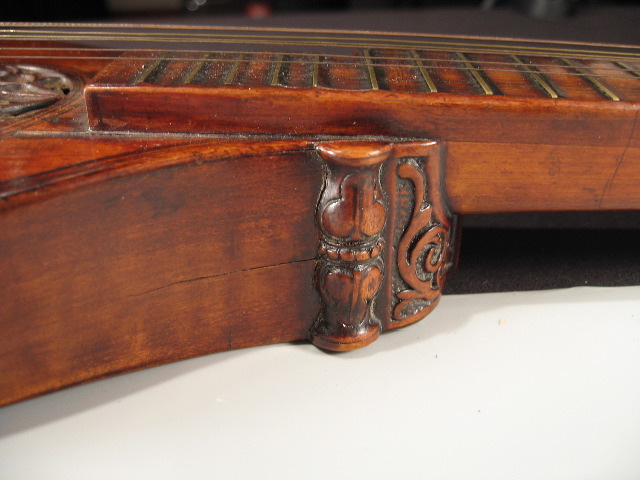 For contact information, see the Cittern Makers and Suppliers page on this site. 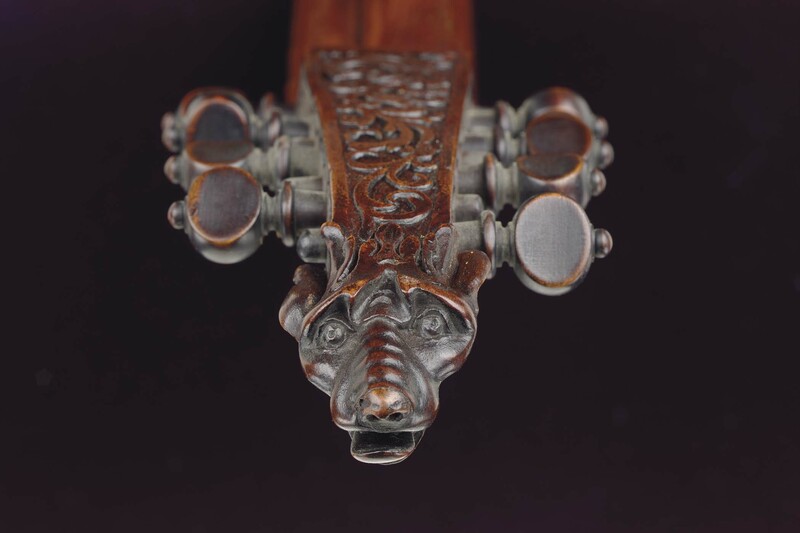 Christie's Catalog: Fine Musical Instruments. Auction: April 2, 2007. Location: New York. Sale No. 1816. Forrester, Peter. "The Morley Consort." Fellowship of Makers and Researchers of Historical Instruments (FoMRHI) Quarterly (July 1989), pp. 46-50. Segerman, Ephraim. "Instruments of the Consort." FoMRHI Quarterly (January 1996), pp. 43-49. Forrester, Peter. "The Cittern in Consort." FoMRHI Quarterly (April 1996), pp. 65-74. Segerman, Ephraim. "Comm. 1468" FoMRHI Quarterly (July 1996), pp. 43-50. Forrester, Peter. "Comm. 1481" FoMRHI Quarterly (October 1996), pp. 27-29. Gill, Donald. "Comm. 1482" FoMRHI Quarterly (October 1996), p. 29. Forrester, Peter. "Comm. 1496" FoMRHI Quarterly (January 1997), p. 21. Segerman, Ephraim. "Comm. 1497" FoMRHI Quarterly (January 1997), pp. 22-24. Segerman, Ephraim. "Comm. 1498" FoMRHI Quarterly (January 1997), pp. 25-26. Segerman, Ephraim. "A Short History of the Cittern." Galpin Society Journal (April 1999), pp. 77-107. Forrester, Peter. "Correspondence. "Galpin Society Journal (April 2000), pp. 347-349. I would like to acknowledge the invaluable help and support given by both Andrew Rutherford and Peter Forrester. As one can see from the footnotes, a large number of e-mails have been sent back and forth. Their patience with my constant stream of questions is greatly appreciated. Also, without Mr. Rutherford's kind submission of pictures and measurements, this page would not be a tenth of what it is. Measurements were taken by Andrew Rutherford and reported in an e-mail to the author from Andrew Rutherford "Re: Christie's cittern - addendum." 13 April, 2007 (not the same email as in note 4, above), with the exception of Fretting, reported in an e-mail to the author by Andrew Rutherford, ibid. note 7, above. Additional measurements (marked with an asterisk *) were provided by Ben Hebbert via Darryl Martin in an e-mail to the author, "RE: 'English' cittern." 11 April, 2007. Two additional measurements (marked with double-asterisks **) were provided by Andrew Rutherford from the National Music Museum and e-mailed to the author, "Re: the Christie's page - at last." 10 June, 2007. E-mail to the author from Peter Forrester. 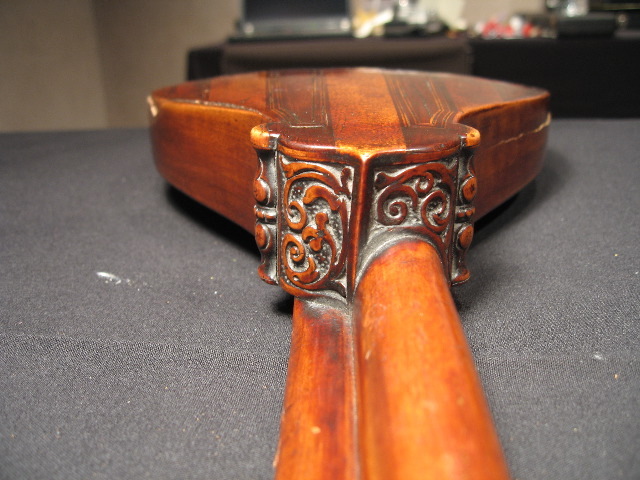 "Re: Christie's cittern - purfling" 24 April, 2007. Mr. Forrester notes, "With age, glue can fail, especially in association with wood shrinkage and distortion. This is particularly likely in the softwood of the sound-board, and especially around the rose. 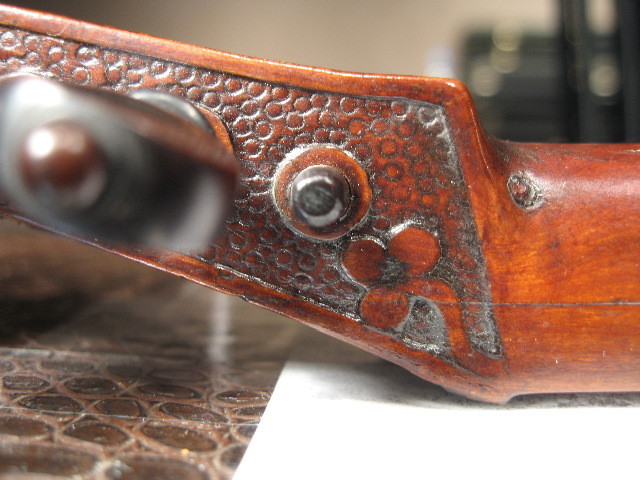 Should the purfling fall out, it can be replaced with new wood or mastic (glue + wood dust; coloured wax/resin; etc.) There may well be gaps just caused by shrinkage where mastic is the easiest filler." 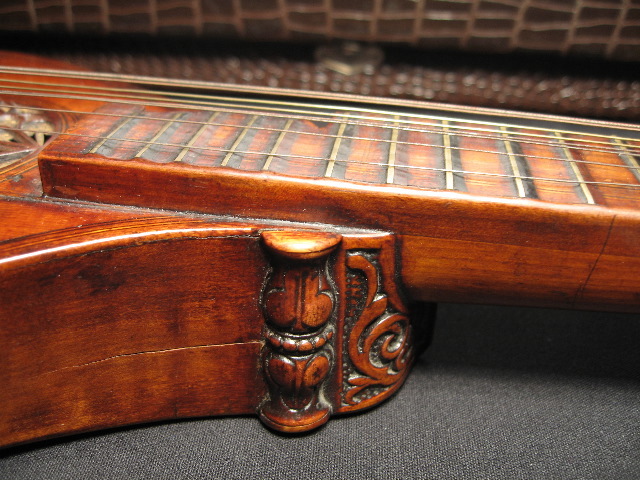 Andrew Rutherford has suggested that the w/b/w purfling could be explained by the use of fruitwood for the fingerboard. E-mail to the author. See note 4, above. How to cite this page: Hartig, Andrew. 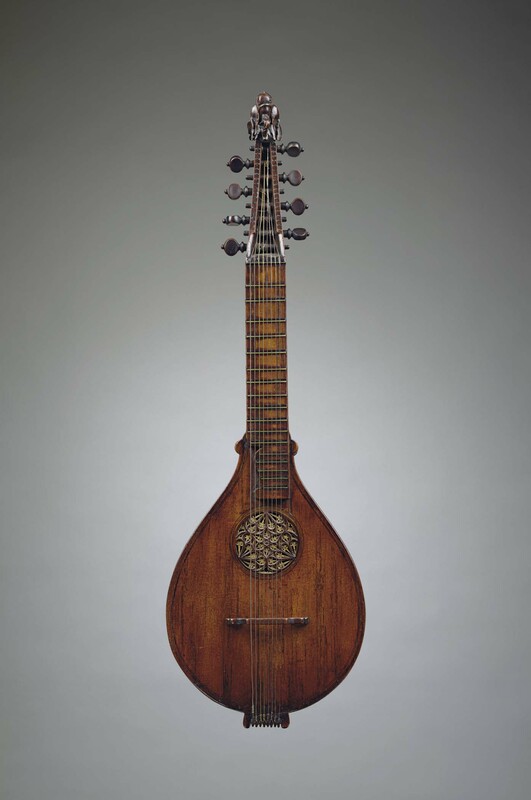 "Cittern, 34cm mensur, possibly English, circa 1600" Renovata Cythara: The Renaissance Cittern Site. Ed. Andrew Hartig. 19 July 2017. 20 April 2019. 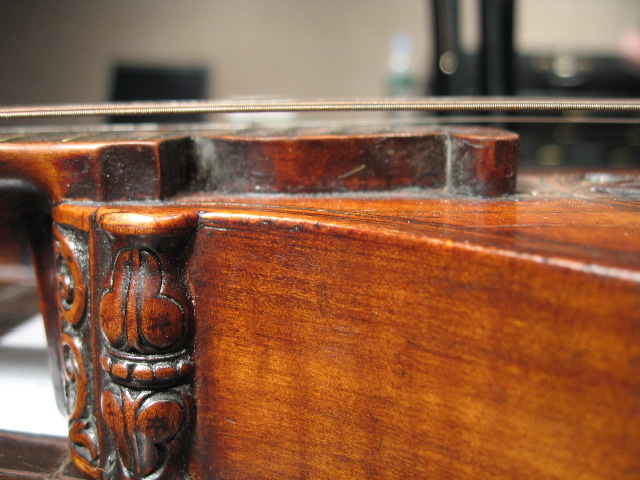 <http://www.cittern.theaterofmusic.com/old/1600.html>.